In my defense, I didn’t set out to target carp with my fly rod yesterday evening. The previous night I was out in the kayak around the same time with the dogs and there were bass jumping all over the place. So this time I left the dogs at home, grabbed a box of poppers, my 5-weight Hardy fly rod, a couple of iced beers and launched around 5:30. The river was pretty low and slow, so I just cruised around, settling in behind boulders where the eddy kept me in place to fish. I caught my first smallmouth in the new Native Slayer, got a crappy photo of it and a few more small ones. Nothing special. Although I did see a very large smallmouth among some underwater logs around a bridge piling. But the river was getting squeezed between the pilings, quickening the current, and I could not figure out how to anchor myself safely to take a shot at him. Special fish know safe places to live. So I moved on upstream, switched colors on my fly and caught my biggest smallie of the day on a white popper, but he was probably no more than ten inches. I was just releasing him when over near the bank I saw a massive carp jump all the way out of the water and splash down. I don’t know why they do this, maybe someone could comment if they know. They’re not feeding on surface bugs like trout. Someone once told me they do it to knock parasites off of their scales. I paddled over to investigate. The terrain underwater changed as I got closer to the edge, and not in the way I expected. The underwater grasses that are quite heavy in the rest of the river were not present along this edge. There were big boulders, deep holes, no grass, and the water was fairly still and much murkier. But in the shadows I could see cruising carp. Big, cruising carp. I even saw one tail up, presumably feeding, in the shallows right along the bank. I was ill equipped to fish for carp with a light 5-weight and poppers. But I had a lone, peach wooly bugger that was on the rod when I put it in the truck. So I took off the popper and tied on the bugger. I looked for movement, mostly just vague shadows but every now and then I could make out the outline of a monster, maybe thirty inches. I threw the wooly bugger upstream and let it dead drift like a nymph along the bottom in the nearly still water. There wasn’t a sound, anywhere. My kayak was dead still. I stared at the end of my fly line a foot below the surface of the dark water, watching for the slightest pull, easing up on the rod ever so slightly to keep contact with the bottom. I wanted one of those carp so bad. On my third or fourth cast using this method I felt like I was really putting the best drifts out there I could. Although I had no idea if it’s the type of fly or presentation a carp might go for. Intensely focused, I felt like I could feel in my fingertips the vibration of the fly tumbling across the gravel below. I waited for the strike. Waaaaiiiit. I could feel the temperature drop as the sun dipped behind the mountains. Three degrees, maybe five. 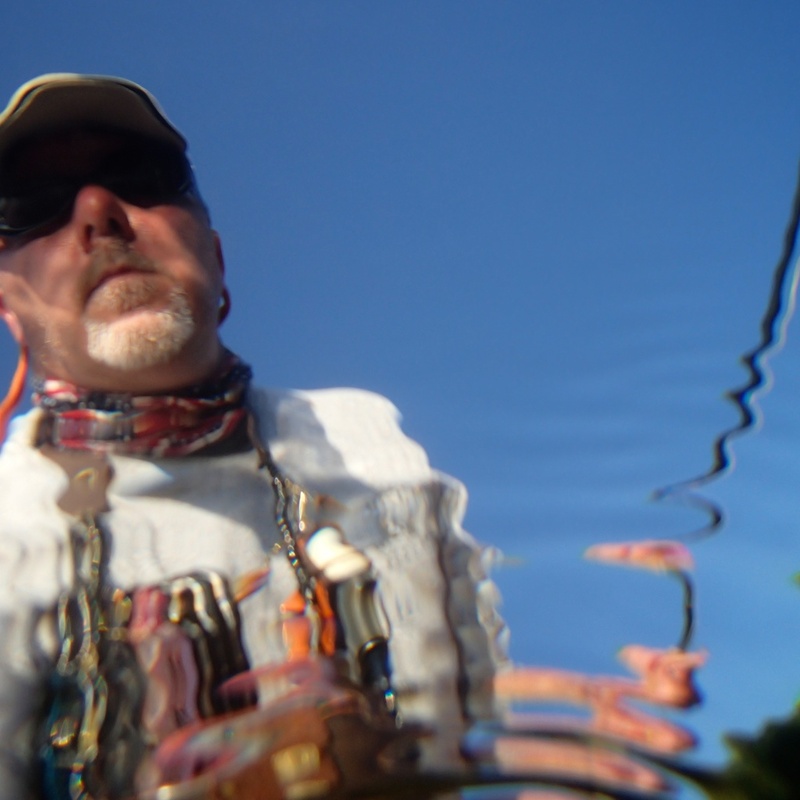 I felt in tune with everything from my kayak to the fly rod, the line, leader, tippet, knot, down to the eyelet, down the hook all the way to the point. All my focus was on the unseen point of that hook five feet below the black surface. Boom! I saw the fly line surge forward at the same instant I felt the bump through the line and into my fingertips. I brought the rod up fast and hard behind my head, finger tight on the fly line to set that point deep. To really feel — not guess, but feel — an extremely subtle take of a fly that you cannot see, and to do it in a place where you have seen very large fish known for subtle takes, and to know when you bring that rod up that you were right and there is life on the end of the line, is pretty damned exciting. But it became immediately apparent that I had not caught my first carp on a fly. 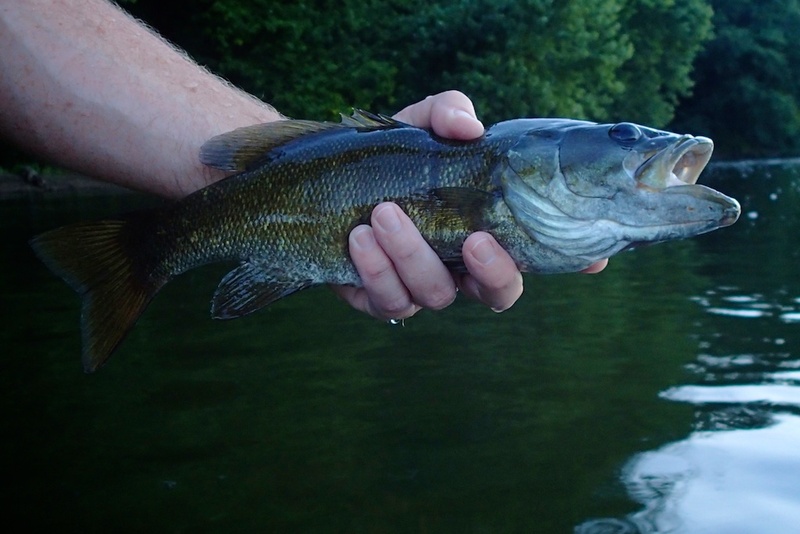 What I had caught, it turns out, with the hook set of a pro bass fisherman on a Saturday morning TV show, was about a seven inch smallmouth. Only the resistance of five or six feet of water kept me from launching that smallie many yards in the air behind me. I instantly felt horrible for the little guy, I literally had to have dislocated his jaw with that hook set. When I got him in the boat and removed the fly, I said I was sorry, that I got a little carried away. He said nothing, which I took as tacit acceptance of my apology. I slipped him back in the water and he shot back to the hole from which he was so violently removed. 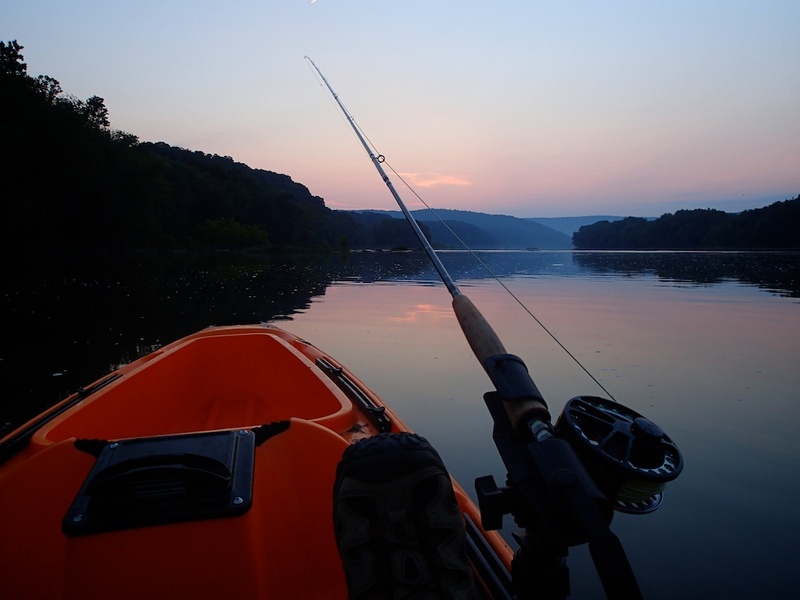 I reeled in my fly line, opened my last beer and watched the sun set over the bow of my kayak. Every now and then I’d glance over at the shadowy depths I had just fished. I was not expecting the opportunity and had no business attempting it, but I had fun toying with them. I’ll be back, soon, armed with a 7-weight next time. I think this might just be the pool. One day I’m going to pull one of those big ugly bastards out of that murky water. One day. On the 4th of July I spent a few beautiful evening hours on my home stretch of the Potomac River, and had one of the most fun outings I’ve ever had here. Conditions were perfect for wading. The level was low but not too low, and the water was crystal clear. 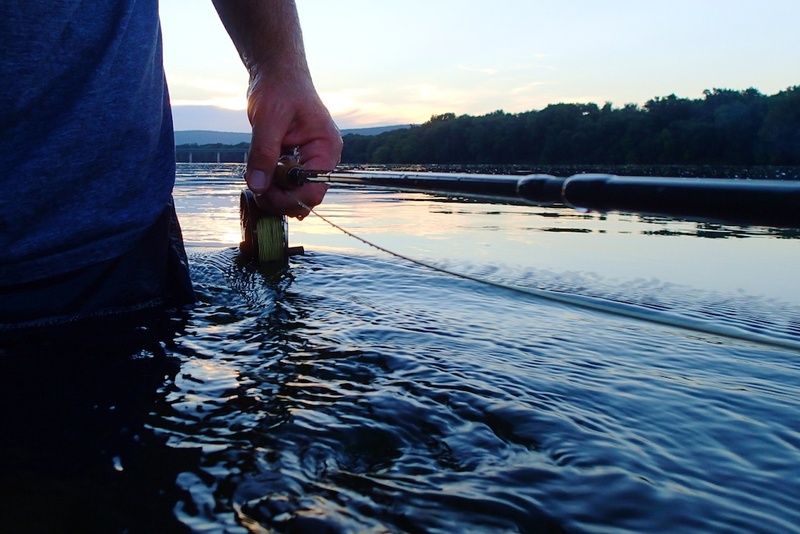 Later in the summer, the grass will take over and the water temperatures will approach bath level. 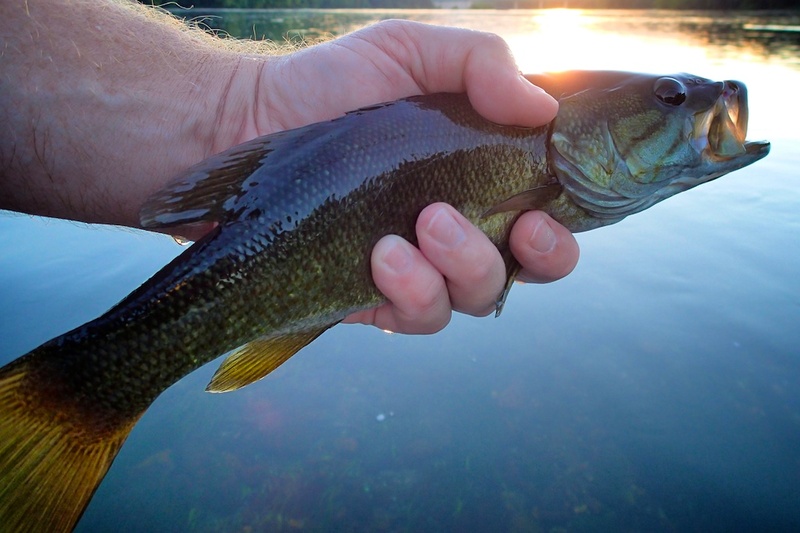 The fishing can still be very good, but it’s less pleasant to be in the water when it gets that way. But for now, perfect. Although the clear water has a down side. You can see below just how well the fish can see me, the camera was completely submerged here. So I find for the most part, some longer casts have good results. There is one notable exception described later in the post. I’ve been really wanting to entice some smallmouth to poppers and other surface flies. I know lots of people who have great success on the top. 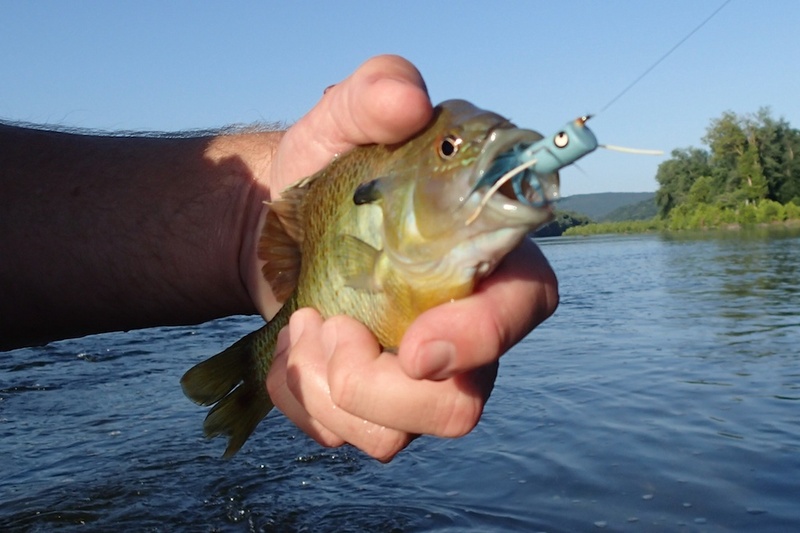 But for me — and maybe it’s technique, location or both — I only catch sunfish when I try surface flies. 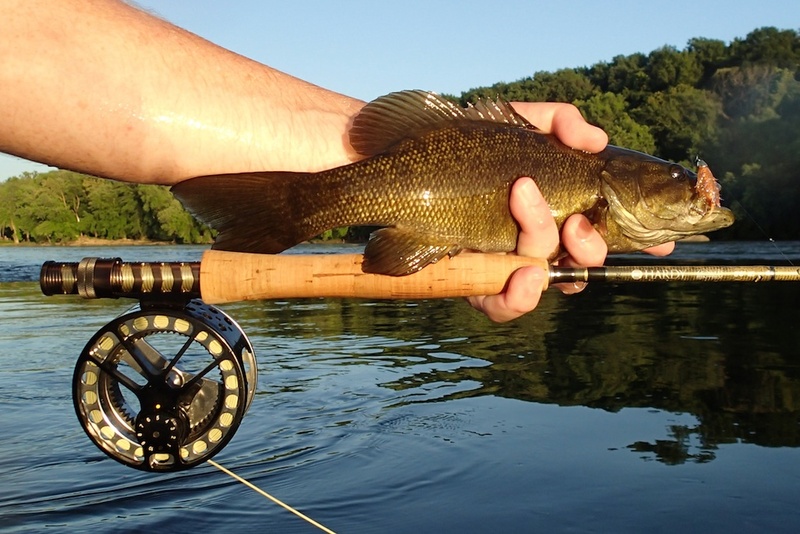 Of all the smallmouth I’ve caught on the fly, I’d say less than 5 percent have come on the surface. 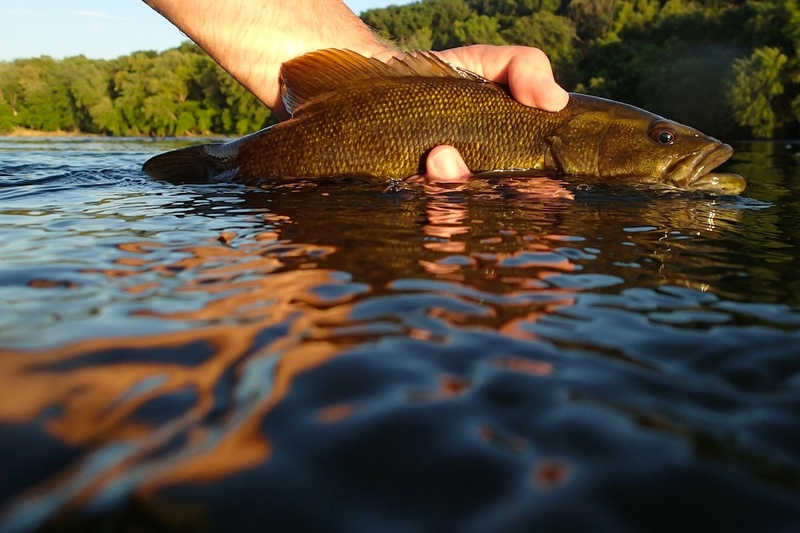 If anyone has some advice on how to entice a smallie to the surface without having a sunfish feeding frenzy, please comment here. So after several sunnies in a row I went back to my go-to fly, the peach wooly bugger from Dead Drift Flies. On my first cast I brought in this beauty, and that was just the beginning. The smallmouth bite was ON, and it was a blast. By the way, this 5-weight Hardy rod is new, and I can’t get over how much fun this rod is. It throws line like a dream, but feels like a 3-weight with a fish on. You feel every tail beat and head shake. Fun, fun, fun. This was the first Potomac River outing this year where I had far more smallies than panfish. 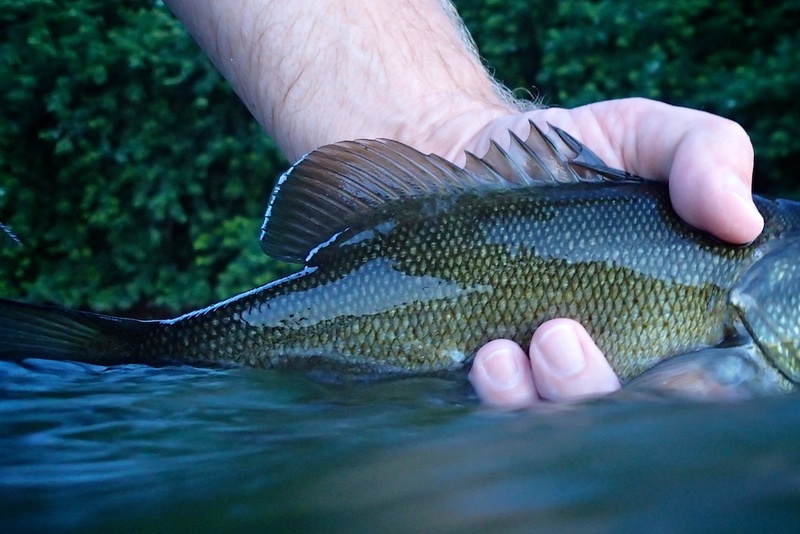 I always catch some tiny smallmouth, and quite a few were what I’d consider large fish for this stretch. But most were about this size, which you smallie hunters know, is plenty big to put up a nice fight! The nicest fish of the day, though, was the last of the day. I had waded upstream from the house a ways, and then went across the river a quarter mile or so. It was so beautiful out there, far from either bank, cool water on my legs, the sun setting upstream and fish enthusiastically biting. But, shallow or not, I like to see my feet when I’m wading, and darkness comes quickly when it comes. So I reeled up, secured the fly and admired the setting sun one more time before wading back to shore. Along the way, now close to the bank and walking parallel with it, I passed three or four holes I fished on my way out with not much luck. I thought I saw a shadow move in the current, but didn’t have a lot of faith in my eyes at dusk. I decided to toss a fly in. I totally half-assed it, though. I never stopped walking, and didn’t even take any fly line out. I just unhooked the wooly bugger from the guide where I secured it earlier, held the rod out to the side and let the fly drop in the water. The shadow immediately slammed the fly. I pinched the fly line to the cork and set the hook, but I think the fish had already done that for me. He jumped four times under the tip of my rod — I basically had only the leader and about a foot of fly line out past the guides. What a great punctuation to a fantastic evening of fishing! Here’s another shot of my shadow fish. It’s hard to compose these fish shots, but some of the ‘accidents’ end up growing on me. I like this one. And that was it. Another 100 feet and an ice cold beer was waiting for me. Because I am an excellent planner. If you enjoy fly fishing for trout and you go all summer just waiting for cool weather to roll around again, you are missing some serious fun with your fly rod!